you and your pet will love. and delivered fresh every time. without the stuff that causes problems. Specially formulated for the extra nutritional requirements of a growing puppy. Specially formulated to give your adult dog health and vitality. Our animal nutritionist has selected the finest, locally sourced ingredients to ensure a great taste and a complete & balanced meal of fresh meats, fish, bioavailable carbohydrates, healthy fats, whole fruits, vegetables, and botanicals that will exceed your puppy or adult dog’s nourishment needs. Small-run processing and direct-to-you delivery ensure the freshest food possible. 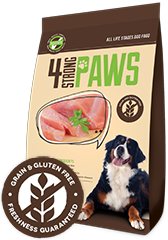 We've also eliminated the common ingredients that cause allergic reactions and sensitivities – grains, chicken by-products & plant-protein – without resorting to the extreme protein levels (31-44%) found in many grain free dog foods. 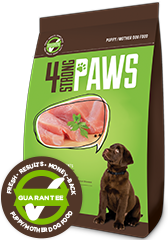 All of our formulations are low-glycemic, meat-first diets that are guaranteed to provide the optimal levels (26 – 28%) of high quality meat proteins for regularly active family dogs. They also include brain & immune strengthening DHA & EPA, antioxidants, chelated minerals, prebiotics and probiotics.